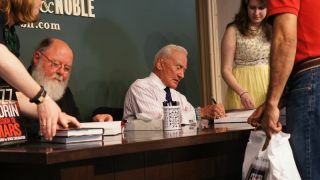 Buzz Aldrin, the second man to walk on the lunar surface, signed copies of his new book, "Mission to Mars," in New York on May 7. NEW YORK — When Buzz Aldrin's new book landed in stores Tuesday (May 7), starstruck fans turned out in droves to see the legendary Apollo 11 astronaut talk about his vision for creating the first permanent human colony on Mars. At least 300 people packed into the Barnes & Noble bookstore in Union Square, some carrying stacks of Aldrin's "Mission to Mars: My Vision for Space Exploration" (National Geographic Books) to be signed, while others just tried to catch a glimpse of the second man ever to walk on the moon. The crowd at Barnes & Noble in Union Square snaps photos of Aldrin, still a space rock star. "I think it's pretty awesome that he's probably one of the only people in the city right now who has been off this planet," said Philip Gazzara, a Queens man who was excited to stumble on the event on his way to Trader Joe's. Buzz Aldrin became a household name his star power when he set foot on the moon on July 20, 1969, bounding off the lunar module just after his crewmate, the late Neil Armstrong. But today Aldrin is firmly against sending humans back to the place he famously explored, for now at least. He thinks the U.S. and a group of international partners need to set their sights on Mars, and ultimately he doesn't want to send astronauts there only to bring them back home. Aldrin envisions sending space pilgrims to colonize the forbidding planet, and his book he lays out a plan to get there, which includes an initial expedition to Mars' largest moon Phobos followed by deep-space cruisers that could ferry people from Earth to Mars. Aldrin and his co-author, veteran space reporter Leonard David, talked about the implications of putting people permanently on Mars. In a Q&A session with co-author, Leonard David, a veteran space journalist and frequent contributor toSPACE.com, Aldrin touched on the historical implications of putting bootprints on the Red Planet. "History, hundreds and thousands of years in the future, will observe that moment of making that commitment to do that," Aldrin said. Whichever leader decides to do so, Aldrin added, would exceed Alexander the Great, Genghis Kahn and Christopher Columbus in solar system fame. Aldrin hopes to have an American president commit to continuous manned Mars exploration by 2019, and he is confident that space officials will have no trouble finding willing pioneers. The astronaut pointed to the 78,000 people who have already applied to become Red Planet colonists with the nonprofit organization Mars One. Not everyone in the audience was as optomistic about Aldrin's vision. Tom Marshall, who came in from New Jersey, had serious doubts about the plan, hinging on U.S. partnership with other countries like China. "If we don't get along down here, we can't make it up there." Asked why he came out to see Aldrin, Marshall simply said, "He landed on the moon." That stark fact proves endlessly captivating to Aldrin's fans and the astronaut handles the inevitable flurry of questions about his Apollo 11 lunar landing with wit. One young boy in the audience asked Aldrin what he did during his trip to the moon, to which the astronaut replied, "We waited until it was time to come home." Another kid asked what it first felt like to step on the moon, and Aldrin answered shortly, "It felt good," teasing that "fighter pilots don't have feelings; we have ice water running through our veins."